Our resident experts offer formal appraisal for rare banknotes. Our appraisals are ISA and IRS compliant. Please send us an email to get the process started. We happily provide free informal value information for buying and auction purposes. There is no cost to get our offer or auction estimate. Just ask. If you don't want to sell outright then we can auction your banknote or collection for you. We have 3-4 currency auctions per year. Each auction contains hundreds of rare and desirable banknotes. The most serious collectors, dealers, and museums participate. Please contact us for more information about our auctions. We are always looking to buy privately for our own collection and for the collections of our customers. We are most interested in national banknotes, large size currency, high denominations, star notes from 1934 and older, and rare Canadian and foreign banknotes. Email or text for a quote. 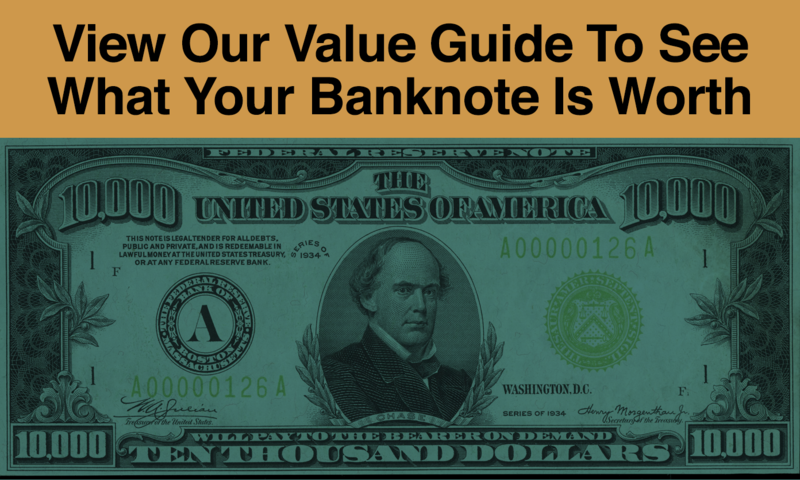 Over the past decade we have handled virtually every type of United States banknote. That includes gold certificates, federal reserve notes, silver certificates, treasury notes, star notes, and of course hundreds of rare national banknotes. Our value opinion is backed by lots of experience. That means that whether you come to us with a banknote worth $500 or a collection worth $1,000,000, we will have no problem writing a check and delivering on our offers. We buy, sell, and auction millions of dollars worth of collectible currency on an annual basis. The majority of our deals are done either face to face or we pay in advance via paypal, check, or wire. You are never shipping to a stranger and hoping you get paid later on. The value of your banknote or your location will never prevent us from successfully working with you. Do You Collect? Sign Up For Our Newsletter!